Wow! I certainly wasn't expecting that. San Francisco's Hammers Of Misfortune are back releasing two albums in a double CD format, 'Fields' and 'Church Of Broken Glass.' This is the first Hammers Of Misfortune release since they cut off ties with The Lord Weird Slough Feg, now known only as Slough Feg. 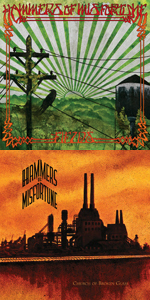 (Hammers Of Misfortune began as a side project of John Cobbett and Mike Scalzi, both members of TLWSF. Scalzi left Hammers of Misfortune after their 2006 release 'The Locust Years,' and Cobbett has since left Slough Feg.) I must say the change has done them good. Hammers Of Misfortune has always used a unique blend of metal, classic rock and progressive rock to achieve their brand of eclectic metal. This time out the Hammers have softened up a bit, maybe drawing more from their classic and prog rock influences, especially on 'Fields.' 'Church Of Broken Glass' is a bit more metal, more like what you might expect from Hammers Of Misfortune. At any rate, both discs sound like an exciting concoction of just about every one of your favorite classic rock and metal bands. On the classic rock side I'm hearing references to Pink Floyd, Crosby Stills and Nash, Uriah Heep, and Queen. You could even go as far as comparing some of these songs, or parts of songs, to acts like The Carpenters and The Mamas and The Papas. Some of the metal comparisons that can be made include Iron Maiden, Black Sabbath, Kings X, Skyclad, Deadsoul Tribe, Aryeon, and Agalloch to name just a few. I could go on and on but you get the idea. Whether you want to try and pick out whatever favorites you might hear in the music, or just want to enjoy the sum of it all, 'Fields/Church Of Broken Glass' is a tripped-out thrill ride filled with everything great that rock music has to offer. Hammers Of Misfortune calls their music eclectic metal but psychedelic metal might be a more accurate definition for this package. If I had to pick between the two I'd probably say that 'Fields' is slightly better, but both are fantastic. I give 'Fields/Church Of Broken Glass' my highest recommendation to all rock and metal fans. 'Fields/Church Of Broken Glass' is a tripped-out thrill ride filled with everything great that rock music has to offer. I give 'Fields/Church Of Broken Glass' my highest recommendation to all rock and metal fans.